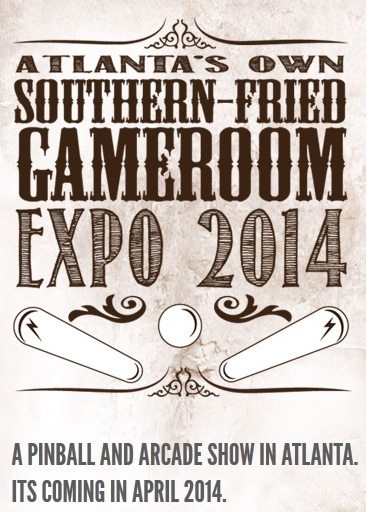 UPDATE: The Southern-Fried Gameroom Expo will now take place June 20-22 at the Marriott Century Center in Atlanta, GA. Check out the updated website for the most-current information. 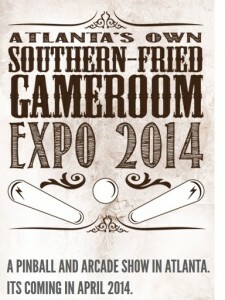 The Gameroom Junkies Podcast thrilled to announce that the first annual Southern-Fried Gameroom Expo is coming to Atlanta in April 2014! The Southern-Fried Gameroom Expo is being planned by a core team of six die-hard pinball and arcade enthusiasts who, just like you, want an expo that we can call our very own. The team has spent the past several months doing research and preliminary planning for the event and are in the process of forming an LLC to ensure this becomes a reality. Basically, it will be a great big arcade party and you’re all invited! More details will be announced during this year’s Atlanta Pin Swap (April 27 in Buford, Georgia). Help us make the Southern-Fried Gameroom Expo a rousing success – visit the website (www.southernfriedgameroomexpo.com) and sign up for the email list. You will be kept up-to-date on the latest developments, including how you can get involved. If you want your voice to be heard in the planning of this event, please take a few minutes to participate in our brief survey (http://www.surveymonkey.com/s/SouthernFriedSurvey). Thanks!